In video interviews with various parents, learn how Highland Hall has made a difference in their children's lives. I fell in love with the school--madly in love with school right away--the moment we stepped through the gate. I felt we were in another world. As people were passing by us, they're actually looking at us and say hello. The kids were saying hello. The teachers were saying hello. Our daughter looked at us and said, "Mom this is so strange. People are like really nice." And they're greeting each other and their nose isn't stuck in a cell phone. Immediately, I was like, "Oh this is a perfect place for 1 year" ... The teacher had told all the all the children to gather these leaves and create this mountain of leaves and I'm thinking, "What are they about to do?" and so she said, "Okay now, let's get in the line, and I want each one of you to run and jump into those leaves. At the very end, was there was this boy who didn't want to do it, and so she said, "Come on, let's do it together" and she took his hand and they ran and they both drove into this mountain of leaves. And it struck me so deeply that this is the heart of a Waldorf teacher. What I didn't understand or even realize what was going to happen was that the teachers here would actually love my child. Jasper was at another neighborhood school, another private school, and he found a praying mantis and was so happy. Picking up the praying mantis, he brought to his teacher in kindergarten and she slapped his hand. And the praying mantis fell down to the ground, and a child stepped on it. And Jasper was devastated, in tears. It just broke his little heart in two. And that kind of thing--it would never, ever happen at Highland Hall. What I love about the school is the fact that it gives parents so much confidence in their kids. I'm really moved by that it's the place where you can let go of your own expectations of what you think your kids should do and what they should be or look like. As a parent it's amazing because you get to let go of your concerns of trolling your kids lives and you don't have to do that here. I don't think I've ever been to school that encourages that. So you get to really be a witness to your kids development and their own personal growth. While their philosophy provides a safe place for children to to learn, they teach them how to learn. To have an idea is one thing, to be able to express that idea is another. It just has such a holistic approach to education. Everything just weaves into the other part...it's it's masterful. The arts programs are really designed to instill a very rigorous academic program. What you learn can be very abstract to the practical application of it. It is I think one of the things that keeps the love of learning alive. And in our children when they started high school it was just something that seemed to be clicking for him. It was almost like I saw his roots grow and it was just very clear that this is great. He loves going to school as much as he drives me crazy like any normal high-schooler. The bottom line is I would say, maybe once a week, he says to me, "I love being at the school. Thank you for sending me to this school." One time, he asked me in the morning when I woke him up, and he says to me, "Mom, I have to go to school today?" I was like oh-no, he's going to say I don't want to go, and I said, "yeah, today's a school day," and he went like this, "YES!" On November 7, 2012, Cynthia Fox of 95.5 KLOS radio, interviewed Highland Hall parents Kristen and Stephen Stills. On a radio podcast and short video, they describe why they chose Waldorf education for their son, and why they feel integrating arts and music into the academic curriculum is important. 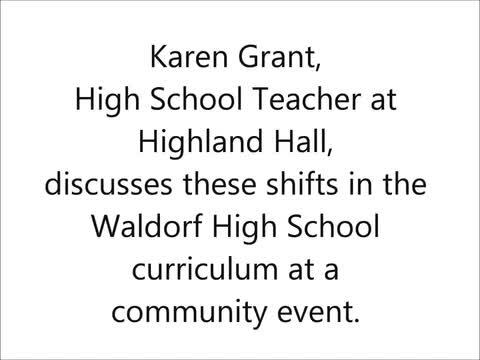 Karen Grant, high school english teacher at Highland Hall, offers parents insights into the developmental approach to the Waldorf high school curriculum. On April 21, Highland Hall hosted a Farm to Table dinner in honor of Earth Day. The food for the event was prepared using fresh ingredients from our own school gardan. Parents, visitors and children at the event were given a tour of the farm by Highland Hall's biodynamic gardner, Nitza Bernard. They viewed the garden beds, which the children tend in gardening class as part of the Waldorf curriculum. They also visited the brand new chicken coop (built by the third grade) and learned about our bee hives on campus. Children in grades 1-6 tend the farm as part of our Waldorf curriculum. We invite you to visit the farm in person...in the meantime enjoy this video. To schedule a tour of Highland Hall, please call Lynn van Schilfgaarde at 818-349-1394 x 211 or email lvs@highlandhall.org. Here is a glimpse of the magic of Highland Hall's May Faire. Enjoy! 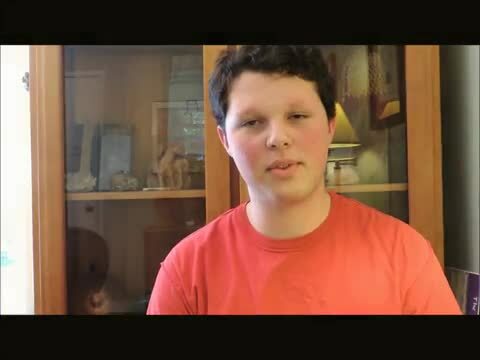 Highland Hall Waldorf School, class of 2014, Adam Adorney discusses becoming a "Commended Student" by the National Merit Scholarship Association and his experience at Highland Hall Waldorf School.